Outside of painted cardboard boxes and foam, toys are the best way to play with Minecraft in the real world. 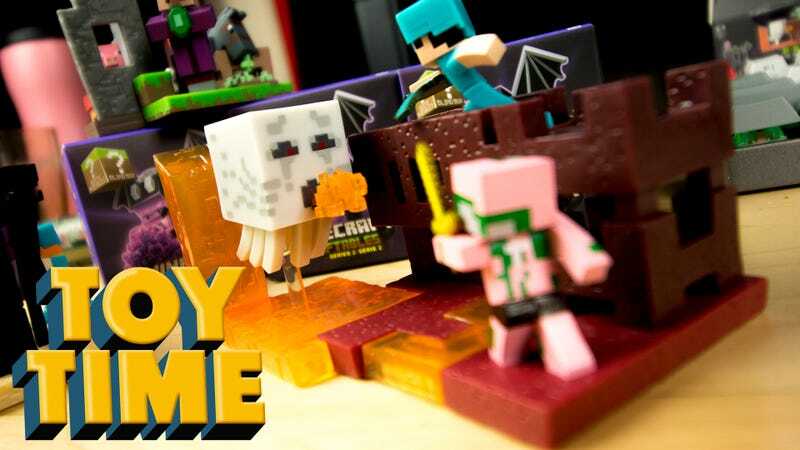 Jinx’s second series of Minecraft Craftables vinyl toys feature nine collectible kits that combine together into three iconic Minecraft locales. The first wave of Craftables, currently sold out at Jinx but possibly available elsewhere, were singular builds. The nine kits in the series each featured a character, creature or combination of the two. Opening one of the blind boxes revealed a set of small vinyl bits that combined into a larger vinyl bit, and the constructing was done. Series two does things a little differently. Each of the nine kits available still function as a solo piece, but this time around the pieces combine into a larger scene. For example, here is the Ender Dragon, freshly removed from its box. Once assembled we’ve got a nifty little figure of the dragon perched on a tower, blowing a lovely translucent gout of purple pixel flame. Here’s another kit. This one is Alex and Steve, outfitted in diamond armor. It’s kind of a weird pose, with the two facing one another. Are they quarreling among themselves? And what of the mysterious Enderman, which refuses to be photographed without blur no matter how I tried? Once the three sets are combined, it all makes sense. Alex is defending against the dragon’s flames, while Steve prepares to loose an arrow in the Enderman’s direction, like that will help. These two heroes are so dead. Meanwhile, in the Nether, Steve stands poised to battle . . . something. Or maybe he’s running away from the zombie pigman, whose base connects to Steve’s set, adding a stream of molten lava to the mix? Or maybe, just maybe, the two of them are teaming up to fight against the creepy Ghast, floating above a bed of translucent orange? My favorite of the three combined sets begins with a pig peeking out of a window. Had I received no other sets but the pig peeking out of the window, I would have been perfectly happy. I would have also accepted the horse with its head stretched over a fence, chewing on some grass. You can’t go wrong with a blocky horse. Especially a blocky horse with a duck attached to its tail. I probably wouldn’t have been as happy had I just received the village priest. With his high forehead and what looks like Burt from Sesame Street’s nose, the dude creeps me out. Put them all together, however, and suddenly he’s not so bad. We now see that the pig feels the same way I do, and the cow couldn’t care less. He’s got a mouthful of grass and a tail duck. All in all, Minecraft Craftables series two is pretty sweet, definitely a big improvement over the original. The only problem is the delivery method. Since these come in blind boxes, fans will either have to pray they get the right nine or purchase a full case of 27, selling off the extra two sets. Considering how well these all come together, that shouldn’t be too hard a task. Minecraft Craftables series two goes on sale on September 15 at Jinx.